Every year as November first approaches I do the math to remember how long ago my father passed away on Día de los Muertos. This year I dutifully pulled up my calculator and subtracted 1996 from 2017. Twenty-one years. And then the obvious hit me. I can always know how long it has been since he passed on to his next life by subtracting 1 from my twins’ age. They are 22 and were just one year old when their abuelo died. I remember carrying Gina down the aisle behind the casket, her and Teo’s new life blooming while that same year Tot’s was fading. I set up my altar this week, pulling out the pictures of my dearly departed and adding new ones from this year. The first step is always laying out the cross-stitched mantel with years of stains and a dark mark from when a candle burned too hot. 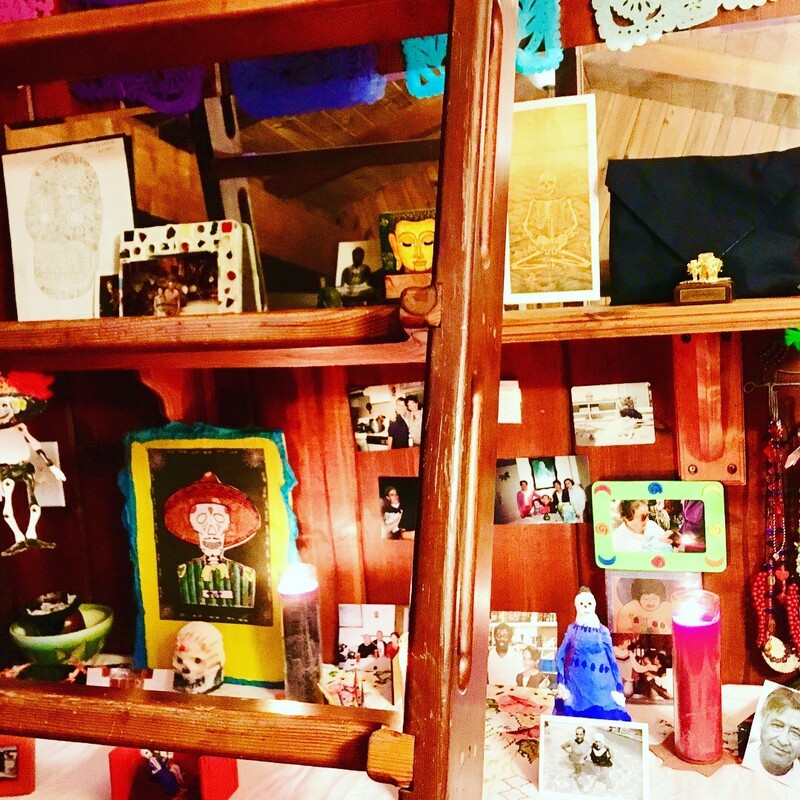 I taped papel picado above the altar, remembering this ritual is not a dirge; it is an opening of the veil to celebrate the lives that touched me and my comunidades. It is a time to think about why I miss them and ponder how to keep them alive in the present moment. I imagine my dad’s disappointed spirit hovering over the Dodgers as they lost in the World Series. I invoke my mom’s stove-top magic as I figure out what to do with a bag of zucchini that must be cooked tonight. I remember the mothers who grieve their sons’ vibrant spirits everyday and send snapchats to my beloved cuates. Día de los Muertos is so ingrained in my being that I kept being surprised by seeing people in costume on Monday, my mind wondering what it was all about. This is amazing given I was so involved in Halloween while my children grew up — making costumes, figuring out what was the healthiest candy to hand out, trading my children’s candy for money so they were not overloaded with sugar and I could store it for the next Halloween. 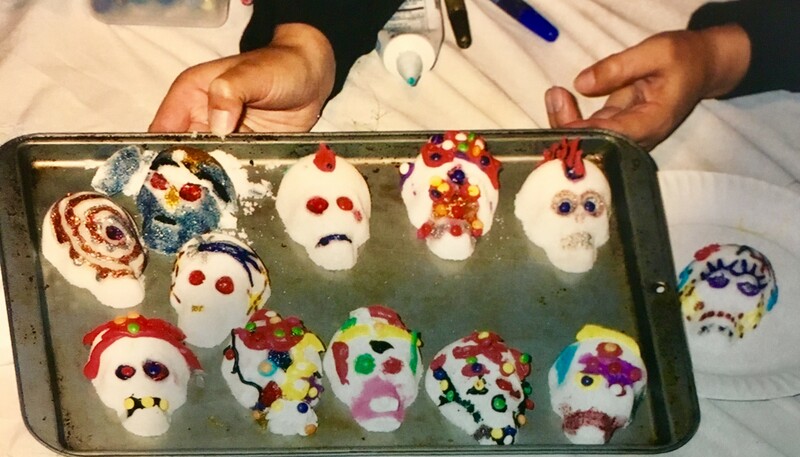 In years past I have hosted gatherings to decorate sugar skulls, loving this tradition of blending death with creativity. I treasured giving my children and their friends the chance to be playful and imaginative with what so many people fear. As a writer I live in that crevice of light and shadow, writing drafts only to end their existence for another version and then another and then yet another. 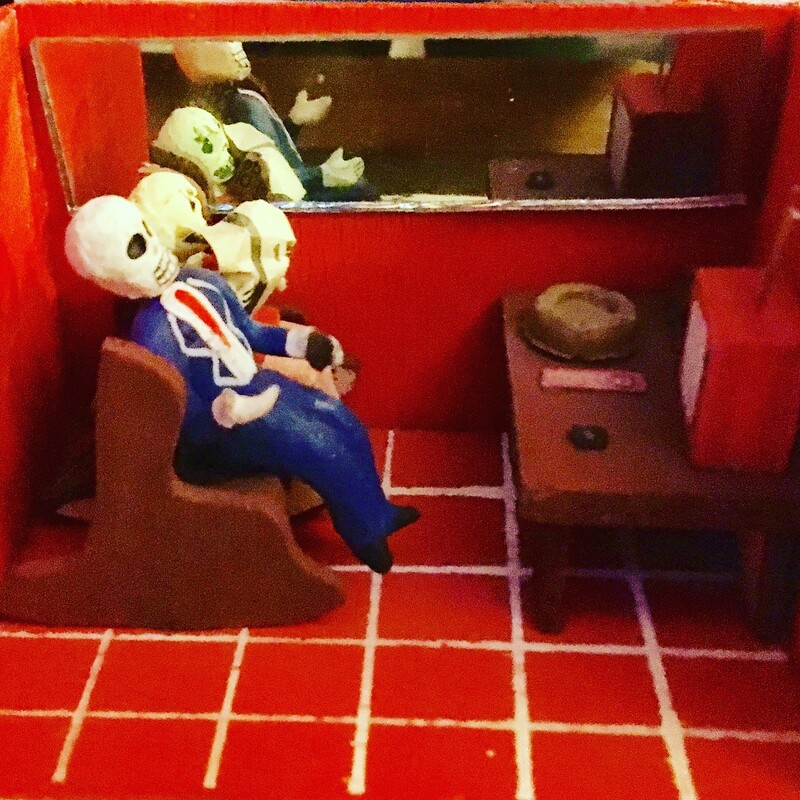 I love t he transparency of life and death, the calaveras that dance and meditate and watch TV. Each skeleton could be anyone of us and one day we will know what our antepasados experienced after their last out-breath. One day we will see there is no separation between any of us, alive and dead. 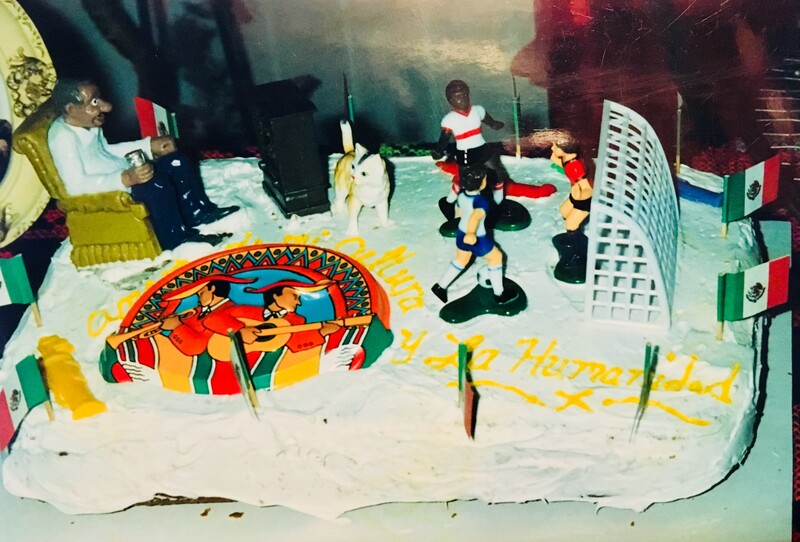 The first and only altar in my parents’ home was the one we created on a cake after my dad’s funeral, laying out the detallitos of his life that he allowed to be visible. The secrets were still within him, wisps of energy that over the years encircled us with cariño or strangled our voices or tripped us as we ran. As I set up my altar year after year, I breathe in the musty smell of the newspapers I have carried from home to home. These crinkled papelitos wrap and unwrap memories and give space for those I loved and lost to whisper consejos in the stillness. I unbind my heart wounds and apply the salve gained from another year of living — that little bit more of perspective and wisdom nestled in my corazón that wraps around me like a soft, colorful rebozo.